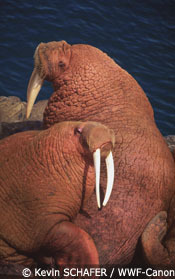 Protect America's Arctic and Bristol Bay by 21st September 2009! The Bush Administration chose to move forwards with plans to lease a vast area - 78 million acres (within Beaufort and Chukchi seas, off the northern coast of Alaska) for offshore oil and gas development. The proposed new leasing was in addition to 4 million acres where leases have already been sold and the energy companies are trying to start exploration. So what's at stake here? Arctic waters are particularly sensitive marine ecosystems. Little is known about the population, distribution and behavior of many species in these waters. High winds, powerful seas, variable ice and cold temperatures challenge offshore technologies, and there is presently no proven method for oil spill cleanup in ice-laden waters. In addition, scientific evidence shows that climate change is causing severe changes in Alaska’s arctic waters, resulting in loss of habitat for polar bears, walruses and seals, and undermining our ability to predict cumulative environmental impacts from oil and gas development. Therefore, WWF is calling for a time-out from drilling in this region until a comprehensive plan has been prepared based on a full scientific assessment of the health, biodiversity, and functioning of these valuable and fragile arctic ecosystems. Urge the Secretary of the Interior to protect America's Arctic by deferring oil and gas development in the Beaufort (there's Beaufort in Sabah too! xD) and Chukchi seas and providing permanent protection for Bristol Bay by sending your own form! Slim & Beauty Sabah in Sabah Trade Centre! Look What I Bought in City Mall! Khloe Kardashian Plans to Wed Within 2 Weeks?? Khloe Kardashian Is Getting Married! Skinfood Isetan Private Sale + Big Bazaar! Dorothy Perkins VIP Week: 20% Off! Gap Canada Fall 2009 Sale 25% Off! Skin Food Online Special: 10% Off! Can You Get H1N1 by Eating Pork?